Posted On May 05, 2015 by Team iCynosure. 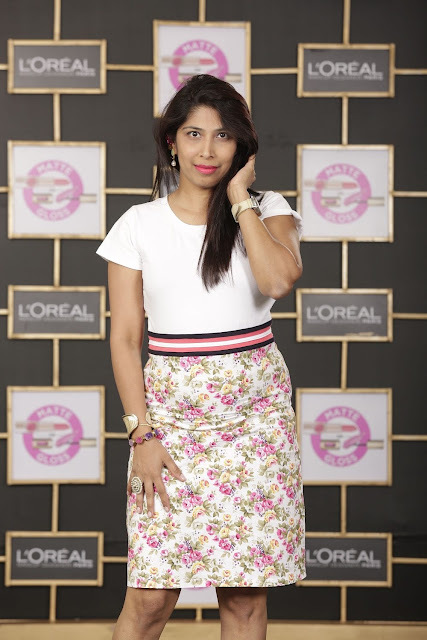 Do you remember earlier this year when L'Oréal Paris, India launched their Colour Riche Pure Reds Collection they invited bloggers from the city for a unique experience. We were pampered by ace Hair and MakeUp Expert, Namrata Soni and then photographed by photographer par excellence, Rema Chaudhary to reveal the shades of the collection. That I thought was pure luxury and hardly any other blogger activity could be more fun and pampering. However I am so glad to say I was wrong and that experience was taken a few notches up by L'Oréal Paris, last week. 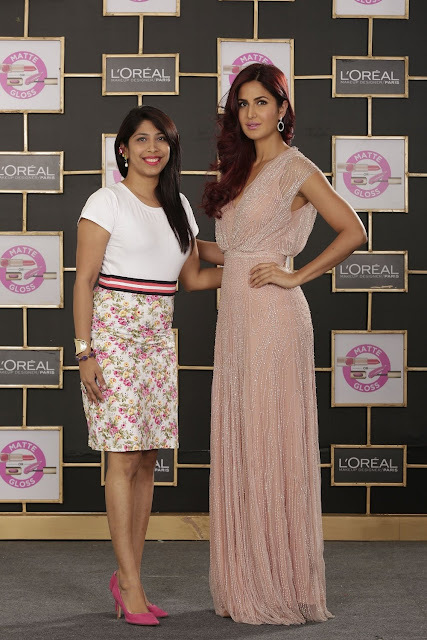 The folks once again invited the same set of bloggers for the launch of the new #CannesStars Collection with ambassadors Sonam Kapoor and Katrina Kaif. 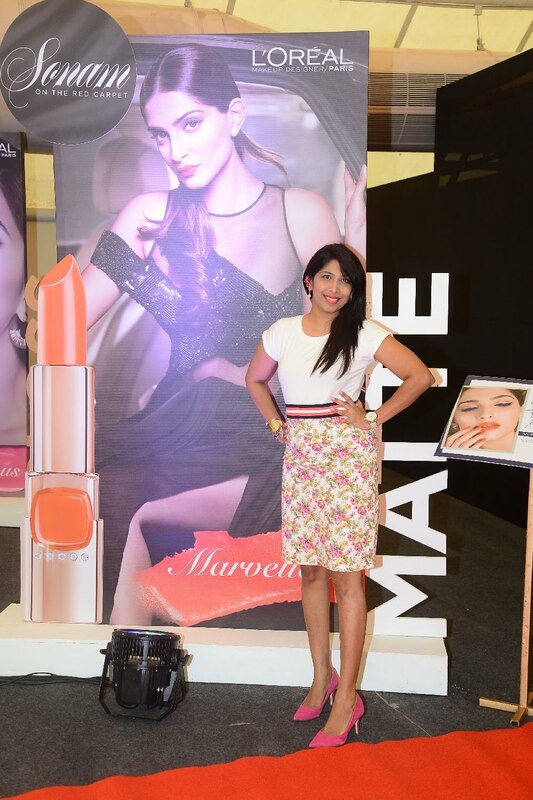 Social media was abuzz with the hashtags #YouCannes #MarvellousMatte and #GlamorousGloss and some really lucky girls got to be part of the collection launch in Mumbai walking alongside the stars. Not likely to be left behind, bloggers also put on their best foot forward in Red Carpet looks for an opportunity to meet and interact with the stars and an exclusive photo opportunity. 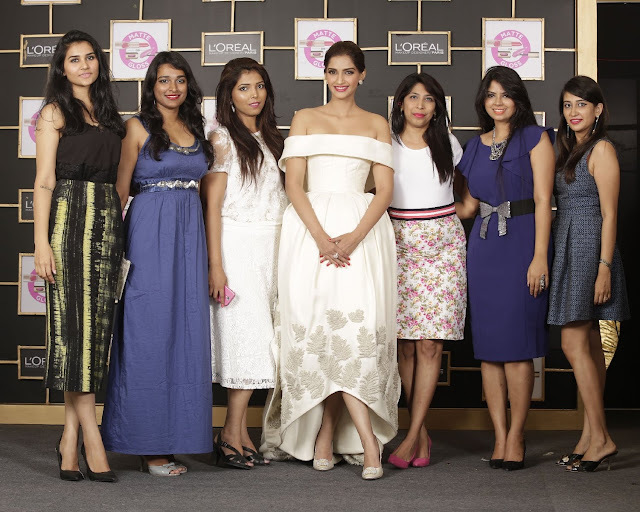 I was excited to be part of Sonam’s TeamMarvellousMatte and experimented with the products sent over by the brand well in advance to achieve the look I wanted. Here is how my look tuned out for the day… I used the Colour Riche Moist Matte Lipstick in Raspberry Syrup and Super Liner Gel Intenza in Sapphire Blue, the exclusive Cannes Collection. Sonam was wearing the same shade as I was and apparently both of us like it the best from the entire collection even though the Cannes 2015 collection has some spectacular shades of gel eyeliner, and less experimented shades of gloss and some beautiful newer Swarovski embellished limited edition moist matte lipsticks. Since at the #RedParty I wore Blake Lively’s Pure Scarleto I was sure that the new Raspberry Syrup matte lipstick would suit my skin tone perfectly. I loved the pigmentation it offered and the staying power is phenomenal. I usually shy away from eye makeup due to the fact that I have super-sensitive eyes but I just couldn’t resist the gorgeous colour of the Sapphire Blue Gel Intenza eye-liner. The brush helps the gel slide evenly and achieves the shape you want easily; it’s now my go-to product for my eye makeup. My outfit is one of the many I purchased from Myntra which I dug out of my wardrobe after wondering what to wear for one whole day. I complimented my outfit with some amazing Vintage Desi accessories including a Namrata Kedia Gold Cuff and Shillpa Purii Pearl Ring. My new Dune London heels suited the outfit perfectly adding the much-needed pop of colour to the entire look. And then of course the L'Oréal Paris, Raspberry Syrup was the icing on the cake. Not to be left behind, I quickly stole a moment to speak to Katrina and got a picture taken too. She is the perfect #GlossGoddess. What do you think about my look? Was it a Hit or a Miss? Leave me your comments. Loving your outfit! Especially that skirt! Can't wait to see swatches of the lip colors!